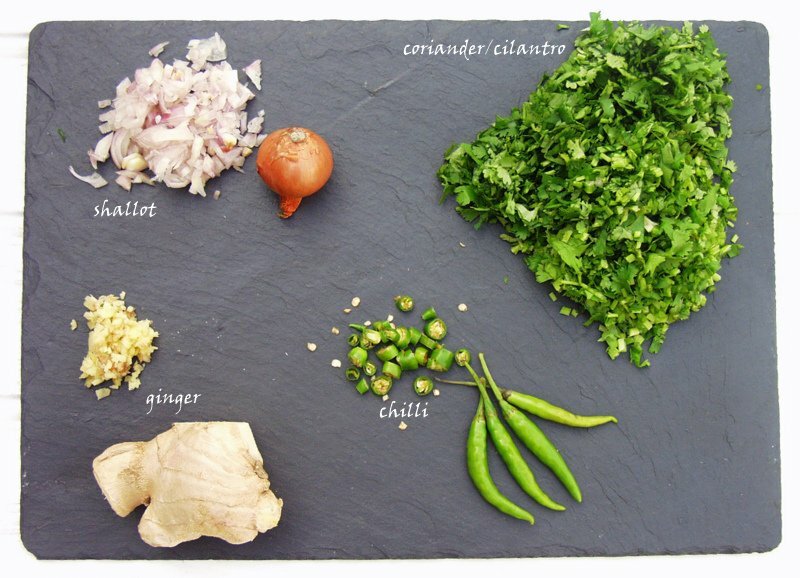 I know that coriander leaves (cilantro for my lovely US/Canadian readers, dhone pata for my equally lovely Bengali readers) divides opinion, but I for one admire the herb for it’s wonderful, bold and punchy flavour. I find it really adds the perfect kick to a dish and brings it alive. For this dish, or perhaps that’s a little bit grand to call it a dish as it ‘s more of a tasty snack, has coriander as the main ingredient. It takes centre stage and while they might not look that exciting, they taste really good and are prefect nibbles if you have friends popping over or if you are feeling the need for an original snack. We’ve been having a roller coaster of weather conditions over here in the UK, with sun-rain-hail-thunder-lightening-rainbows all in one day, so outside play action for big A and little Z has been only temporary. Inside the house we get creative in all manner of ways, and cooking little delights is something we enjoy doing together. 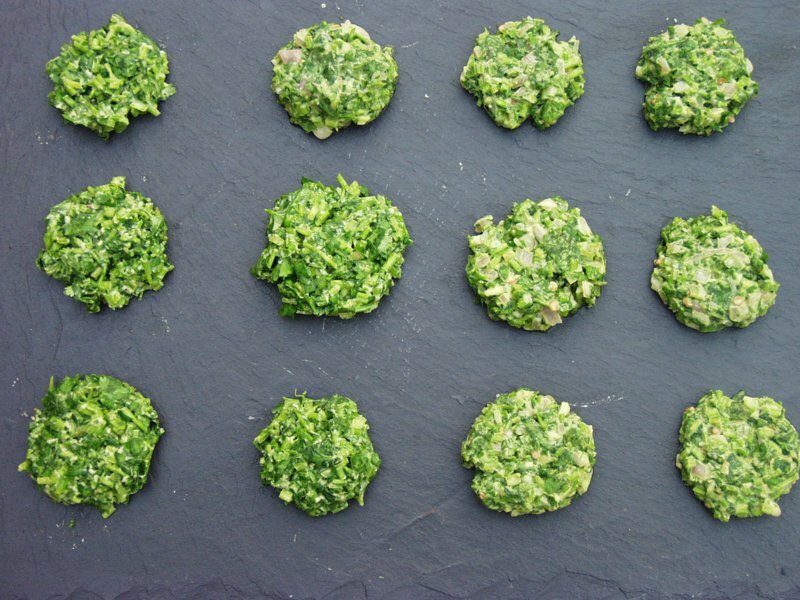 These bite sized fritters are easy to prepare and the girls love to help me put them together. We make an extra batch for them, without the chilli, but for a more mature, adult palate I add lots of chilli. 1. Finely chop all the fresh ingredients and place in a bowl along with the flour (I simply used plain instead of gram this time), salt and water. Add the water a little at a time so that the fritters are not too moist. If they do become too moist simply add a little more flour to bind them together. 3. Heat the oil in a pan and when it is hot gently place the fritters into the oil and fry on a medium to low heat for a few minutes. When the undersides have darkened turn them over and let the fritters cook throughly on the uncooked side. The cooking time should not take much more than 5 minutes. 4. Serve and eat immediately. They also word well with dal and rice if you want to make more of a meal out of them. 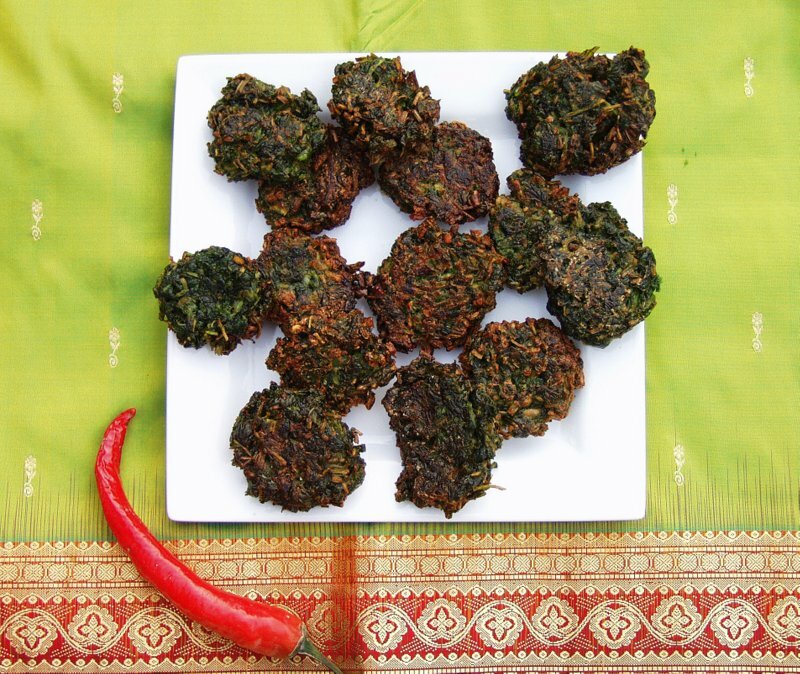 This entry was posted in Snacks, Vegetable, Vegetarian and tagged cilantro, Coriander, dhone pata bora, ginger, gram flour, green chilli, mustard oil, plain flour, shallot. Bookmark the permalink. That’s kind of you to say Ken, thanks. Not sure if it appeals to a mass audience….yet, but am trying. Good to hear Flora. Did your Vegan friend like the okra stew? I like it. It sounds delicious. These were amazingly good. My husband does not like cilantro but when he had one of these he could not stop finishing off the entire lot. Thank you so much. That is so lovely to hear. I adore them too and they are always a crowd pleaser.